Oh did I hear beautiful things about Natatorium! Produced and written in the shade of Tangerine Dream concerts and shielded from important music distributors, this last Picture Palace Music opus let itself wait (and desired) a long time before landed on my Cambridge CD player. So, those who like frenzied sequences, with a demoniac crescendo à la TD’s Poland style, are going to drool. Those who also like good chiseled guitar solos polished with strength that wind and unwind lustfully are going to have ears full of it. And those who like the sound explorations of a gloomy and somber world where stream of whispers makes us paranoiac will clean out their ears to make room. 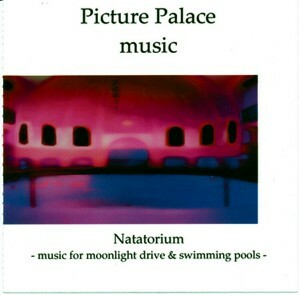 And finally those who, as myself, thought that Curriculum Vitae I was a small masterpiece will be quits to revise again their scales of musical values, because Natatorium – Music For Moonlight Drive and Swimming Pools goes farther and exceeds the weird states of CVI. An extraordinary opus divided into 2 acts, among which the first 5 titles are fitting together and The Gretchen Tragedy ends it with a poetic and melancholic touch. An opus which begins as “Q” uses to amaze us. Shouts and whispers of a lively city district open Drowning Moon and Eleven Suns. A soft synth is floating there, as the breezes of a ghost lost in this living mass. A line of bass is molding its trail, accompanying a keyboard with solitary arpeggios. Already the atmosphere of Natatorium soaks by a pleiad of theatrical tones that shape each of the present compositions. A magnificent sequence hiccoughs and skips frivously in this atmosphere as realistic as strange. Percussions fall and dress more and more this introductory track which takes a dramatic bend with the gravity of its structure which grows richer by the addition of a memotron with discreet and warm breezes. Drowning Moon and Eleven Suns is a hybrid track which hesitates between two rhythms and falls in the magnificence of Moon Dial which possesses the fury of Redshift and TD’s Near Dark, while embracing the rhythmic structure of a wild Poland. Moon Dial begins very innocently on a heavy and minimalism sequence, soaking in a pleiad of sound effects all so ingenious one from others. The sequence increases a heavy tempo with a spiral and syncopated tangent, while subdividing its heavy rhythmic to embraces a 3rd sequence which follows the paths of a frenetic Poland, in an angelic sound atmosphere. The beauty of darkness which spreads out in our ears where shabby noises nibble a structure became wild, bitten that it is by magnificent and shrill solo of an aggressive guitar. Solos that tear a so quiet and serene mellotronned veil, that we can only be between two worlds. Totally brilliant! At midway, a drum explodes the rhythm which becomes even more torn between its diverse cadenced options. When I say ears full! It’s with our ears full that we savor this brilliant opus which amazes from track to track, so much the sound and musical creativity is dense and strongly tinted of musical paradoxes. Blue-Hour-Glass is leading us in a somber nostalgia with a magnificent piano drive by hesitating keys which stumble over a mellotron violin with metallic chords. A beautiful piece of music where the tranquility is toppled over by more violent and intense passages where fragments of The Who’s Reign Over Me cross our memories. All in softness Blue-Hour-Glass pours into Risk Pool hemmed intro, giving back to Natatorium a thunderous rhythmic on a good bass structure and a synth with ghostly loops which glance through clacking percussions as well as a vocoder with sieved vocalizes. Risk Pool is taking us in the meanders of a techno slightly cleaned up by a synth with sprawling veils and wild variances rhythms, dipping us back into the nostalgic sweetness that soak on this work with the soft Drowning Suns On Moonlight Drive and his frivolous chords that dance as a graceful ballerina would do on a stormy water. A magnificent final for a first act full of an astounding creative intelligence! The Gretchen Tragedy (Faust Outtake) concludes on a somber ballad where thousands of sounds waves collide on a soft fluty mellotron, bringing us back peacefully to home of reality.